In a society where students and their families are being bankrupted by student loans, it is nice to see a film - a comedy - in which people are fighting to help students get a fair deal. In the movie, Bankstas, two best friends, end up doing what their parents could not do, fight for what they believe in. 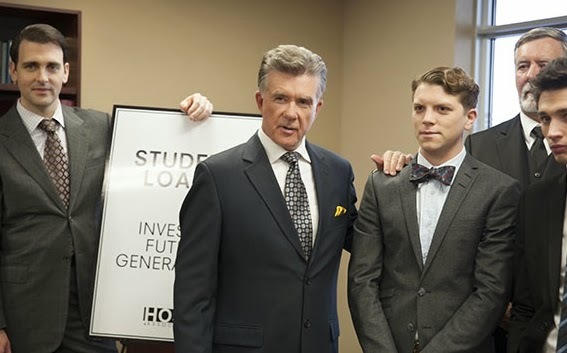 Neal (played by Michael Seater) and Isaac (Joe Dinicol) are college graduates eager to enter the business world. But, when they land their dream job with a major investment firm, their lives are thrown into turmoil. Upon finding out their boss's crooked student loan deal, they take it upon themselves to expose the truth. This is a comical movie, however, it's not as humorous as it tries to be. Particularly Isaacs "b-boy" character and the obnoxious son, Pistol (played by Brandon Firla). What I do like about this film, is it's clear plot. Neal and Isaac are determined to stop their boss's corrupt student loan deal. The script is consistent and well acted with well known actors such as Alan Thick and Laura Vandervoort contributing to key roles. And, although you can foresee the outcome of the movie, it's still fun watching it play out. Overall, it isn't a terrible movie, but it isn't anything that should be viewed more than once. I give it 2 stars for being entertaining.